Stop that tank! With the imposing title and the baritone voice instructing the viewer, technology, grit, and the well placed shot from a Boys Mk. I anti-tank rifle would stop the German armoured onslaught. The film of the Boys was indicative of North American entertainment as well as the training which allowed the soldier to learn, but also be entertained. However, the way in which Disney came to produce this wartime film for the Directorate of Military Training is a story of its own. The concept of using visual media to train soldiers was not new. Illustrative manuals had been around since the 1700s and with World War II in full swing, any methods of quickly and effectively training troops in the ways of war were adopted. For the American military, comic book artists were used to create training manuals and posters that often told of how NOT to handle equipment, as was demonstrated with comic artist Will Eisner’s US army series Joe Dope, and Len Norris’ work in CAM. So when the opportunity to make a cartoon to train offered itself, cartoonists came to assist. Walt Disney had been known for his animated masterpieces, but as World War II began for Canada, his studio was embroiled in a labour dispute. After the US government was brought in to mediate the issue, Disney found himself in a rather significant monetary crisis. To make amends to the U.S. government, Disney had the studio produce movies on behalf of the US military, as well as many other countries. By 1941, Disney was approached by the Canadian military to make a film on the operation of the Boys. The resulting film Stop that Tank! was approximately 21 minutes in length, and certainly met with Disney standards. The first four minutes were a typical cartoon with tanks that bent and wheezed while attacking positions that were aptly defended by Canadian soldiers wielding the Boys. As the tanks closed, the soldiers opened up and quickly drove the tankers, led by Hitler no less, back from whence they came. The remainder of the film concentrated on the components, maintenance and use of the weapon. Where animation proved itself of great worth to the Allied (and to a lesser extent Axis) armies was the way in which the operation of a weapon could be illustrated. Pictures of the bolt assembly for example do not photograph well, and the cartoons or illustrations could demonstrate how the parts fit together and how the parts work in unison. Another aspect of the weapon was its importance to the battlefield. The cartoon demonstrated the proper angle of the bullet to obtain the best damage. More significantly, the film showed the need for inter-service cooperation. The idea of the Boys rifle was to create a mobility kill, which might take a tread off a tank or disable the traversing mechanism of the turret, then the artillery or anti-tank aircraft would finish off the tank. Finally, the film showed how to properly clean and maintain the weapon. Given the weight of the rifle, which clocked in at 36 pounds without ammunition, a stout figure was needed to operate the weapon. However, given the manner in which the film demonstrated the aiming, field stripping and maintaining of the weapon, I feel like I could reasonably fire one after watching the characters operate it. This film was not meant to be the sole item to train the soldier on its use and firing, but it certainly augmented the training cycle for such a specialized weapon. The film also tried to demonstrate how the Boys was based on the SMLE which Canadian soldiers were familiar with already. This film was not the only one that Disney produced for the National Film Board. There were also four short bond drive cartoons, and a film on how to effectively rivet aircraft components. 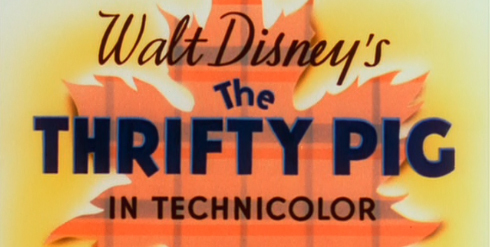 The four films included in the Disney set included Thrifty Pig (1941) a take on the three little pigs story with the wolf as a Nazi; Seven Wise Dwarves (1941) in which the seven dwarves of Snow White fame invest heavily in War Certificates; Donald’s Designs (1942) and finally All Together (1941) in which the entire combined Disney cast marched through the streets advocating the “Five for Four” campaign – a five dollar war certificate for four dollars –that would allow the Canadian government to purchase needed war materiel. These films are now available online or from the Disney archives collection. They are part of a history of Allied training that utilized common visual media of the day that the soldiers as youths had been exposed. It also certainly gave light to a situation that needed the utmost understanding of the workings of a weapon that could sway the battlefield. And if one was a great shot, one could certainly stop that tank!